Have you ever visited D.C. in the springtime? If you have, you know all about the cherry blossoms. The trees are beyond gorgeous, with little delicate pink blossoms sprinkled all over the tidal basin. It’s so lovely. It’s also mega-crowded. The tourists come from everywhere to see the blossoms, and it’s almost impossible to walk. People just shuffle along, elbow to elbow, taking awkward selfies. Still, cherry blossoms in D.C. mean spring, warm breezes, and fun cookie flavors. How could I not try to put all that cherry blossom aura into a cookie? So I did. In general, there’s a lot of excitement in the air. I teach high school seniors, and their final exams are next week. If they didn’t mentally check out weeks ago, you can bet they’re long gone by now. Some of them stop turning in homework or coming to class with a shamelessness that would shock their parents, if they knew. If. Every year, I sit through graduation as multiple emotions assail me. I get hit with good feelings, like pride and flat-out happiness, but I also get annoyed sometimes at the kids who cross the stage who gave everything minimal to no effort. I wonder if they’ll keep doing that, or if they’ll learn to take the chances they have and treasure them. In the end, though, I try to focus on the positive. Everyone looks nice, the ceremony is celebratory, and best of all, there are cherry blossom cookies in the world! These are soft-baked cookies with Nestle bling. 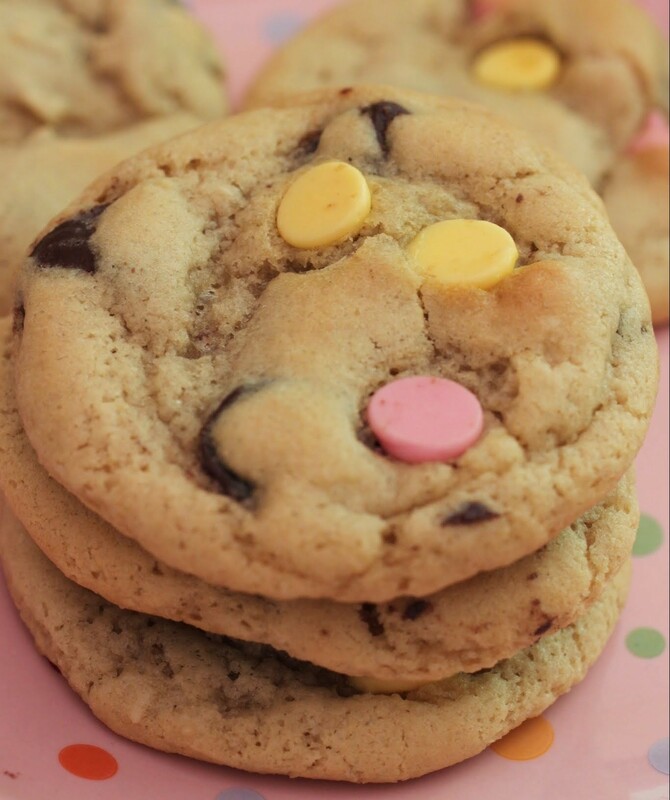 Not only are they filled with Nestle cherry-filled chocolate chips, but they’re also studded with spring color chocolate chips. Aren’t they cute? I’m all about cute. A few weeks ago, a student made a cookie recipe from my blog and as soon as I saw the cookies, I knew she’d broken the cardinal rule: chill the dough. Do not skip this step! It’s vital. Also, subbing in some almond extract for vanilla is key to giving these cookies their distinct flavor. The almond complements the cherry perfectly. It’s tourist season here in D.C., which coincides with graduation, spring, and all things warm and wonderful. Enjoy some cherry blossom cookies! It’s a lot easier than fighting the crowds at the tidal basin. Combine the melted butter, brown sugar, and white sugar together until the mixture is smooth. Stir in the egg and the egg yolk, incorporating both fully. Finally, add the vanilla and almond extracts. In a small bowl, combine the dry ingredients. Add the mixture to the wet ingredients and mix well. 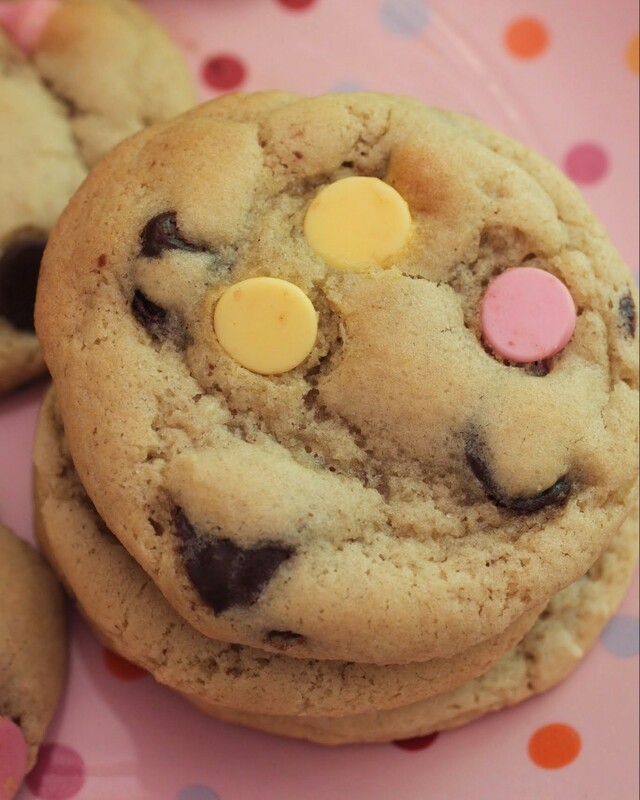 Fold in the cherry-filled chocolate chips and spring edition chocolate chips. Grab a cup of tea, because this is the cookie it was meant to hang out with! The week should be winding down, which is good. My head is packed with to-do lists and tasks, and it’s always a good feeling when Friday evening hits and everything comes to a halt. No calls, no texts, no notifications. Just me and the fam! When life gets crazy, cups of tea are important. Sometimes, I need a little more than just tea to calm down, and that’s where a good cookie companion comes into play. 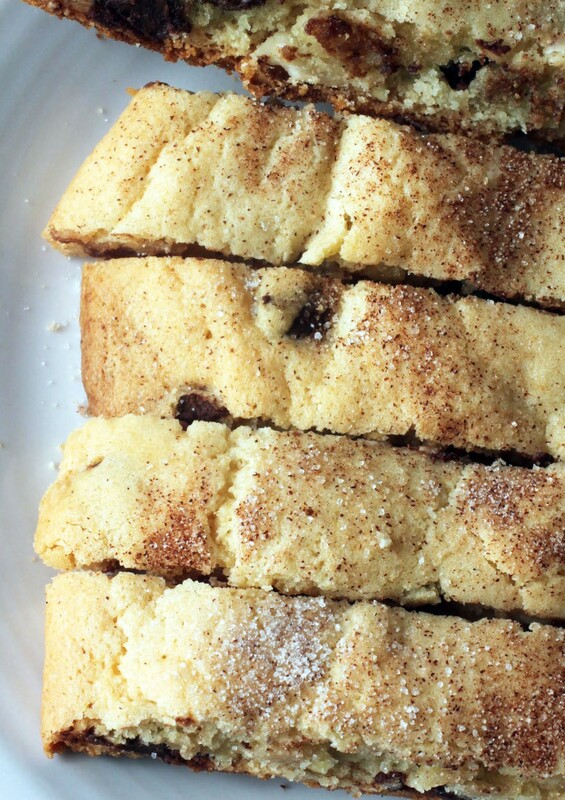 These Eastern European cookies are very similar to biscotti, but they’re built on a smaller scale and have a little more softness to them. The traditional version just contains nuts, but I added chocolate chips and a nice sprinkling of cinnamon sugar on top. You can’t go wrong with that! It’s hard to make kids happy sometimes. The more effort I put into cooking, the less they tend to appreciate it. If I make really good homemade crispy chicken tenders, for instance, they’ll leave them on their plates. But if I buy the frozen processed ones and throw them on a baking sheet, my son will very nicely thank me for such a delicious dinner. No, I’m not a lousy cook. But I don’t speak kid palate. Their likes and dislikes remain elusive to me. That’s why I had to try these cookies. They are just so adorable. And I needed to know if their looks would trump everything else. 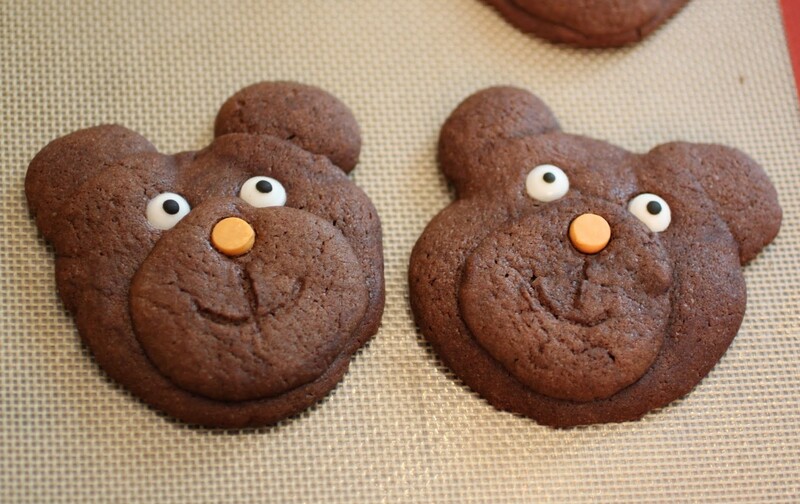 Does a teddy bear-shaped cookie get eaten no matter what it tastes like? There’s your philosophical question of the day. I have never visited D.C (apart from going through the train station), but I hope to this September. I actually have a cherry blossom tattoo. September is a great time to come! Not too hot, the tourists are gone, and usually pretty sunny! That’s so cool about the tattoo. I think cherry blossoms are beautiful! How have I not heard of cherry filled chocolate chips?! I need these in my life. 🙂 I’ve only been to D.C. once in my life and it was during the spring. Luckily, my sister and I did our tourism during the week, so it wasn’t as busy as I thought it would be. I can’t believe you’re done with school next week, Mir. We’re still in session until June 18th! They’re so good, Erin. You can get them at Target or a lot of grocery stores. And just the seniors are done. Everyone else is here through the 17th, so we’re right there with you! Oh I love that you made cherry blossom cookies after all of the pretty trees in your area! These cookies look like the perfect start to a Monday. Love the flavors! The trees in this area are pretty amazing. I never realized so many blossoming ones existed until moving to DC! And they’re lovely enough to deserve cookies named after them. I’ve never actually seen them with my own eyes in DC but definitely know about the cherry blossoms. love these cookies!!!! yes, I can’t believe it’s almost June and school is almost over! Where did the year go?! it totally flew by. . those are some great reflections that you have during graduation . . I’ve often wondered the teachers think about. . last week I was volunteering in my daughter’s classroom (I do twice a month) and jokingly asked her teacher, “How happy are you that the school year is almost over?” and she was like “I’m sad, I’m going to miss these kids . .” it was so sweet! The years get faster and faster, Alice. At least, I feel that way. And I do miss the kids, but then new wonderful kids come in (usually), so it’s fun to meet new people every year. It’s like a parade of personalities, in my life and then out. And I can bet that most teachers are spacing out during graduation. I try to concentrate, but it’s hard! I would LOVE to visit DC in the spring to see those beautiful Cherry Blossoms! These cookies look pretty and yummy too!! It’s worth seeing once, Renee! The pink everywhere is just so pretty. And DC has some great bakeries, too! 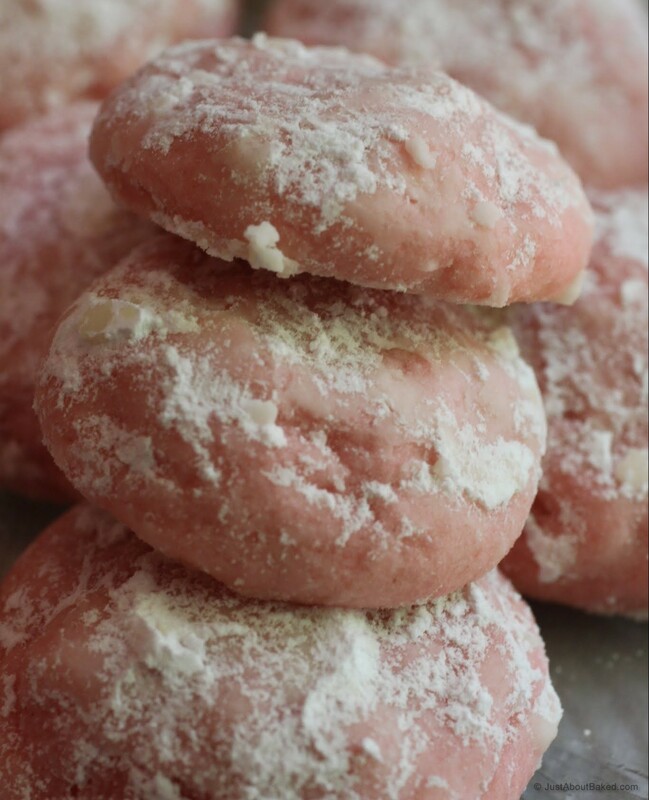 I don’t know that I could handle the crowds in DC (and I only live about 2 hours away yet I’ve never been to see the cherry blossoms) but I could certainly handle some of these cookies right about now. Very cute! The crowds are crazy. The best time to visit is in early fall, when everyone is back to work and school and the city is emptier. I always love being a tourist in my own city. Thanks, Sam! Wow, cherry blossom cookies? These sound and look delicious! I once visited DC in the winter and it was cold 🙂 Would love to be there in the spring ! Yep, would not recommend coming in the winter. Spring is lovely, fall is lovely. I love hot DC summers too, but there are tourists everywhere. I like to go places they miss. Thanks, Mira! Your son should head this way. DC is a great city. And then you can see the blossoms! The idea of “Nestle bling” just makes me happy!! What a great idea for a cookie! I have been to DC but not seen the cherry blossoms, the pictures are so pretty..have seen them around! 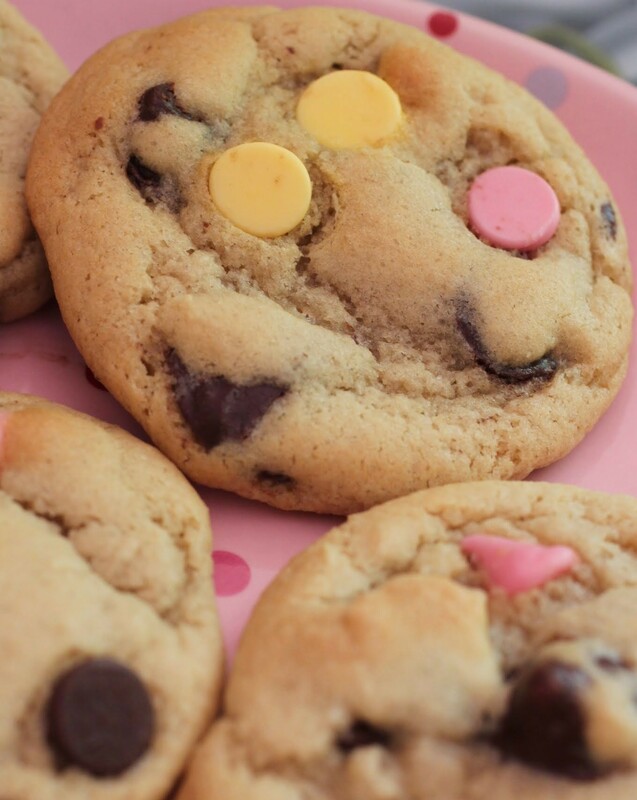 The cookies look amazing, and this reminds me that I got these spring time chocolate chips a while back and haven’t baked with them yet :/ I clearly need to do that asap! I always buy the products and then forget to use them, Manali! So I’m glad I could remind you. The cherry blossoms are seriously pretty. I love them! Love the cherry filled chips! And also Cherry Blossom season! This was the first year in 10 or so years I didn’t perform at the festival. Looks awesome! Well, everyone needs a break now and then, Medha! But the festival is really cool. Thanks! 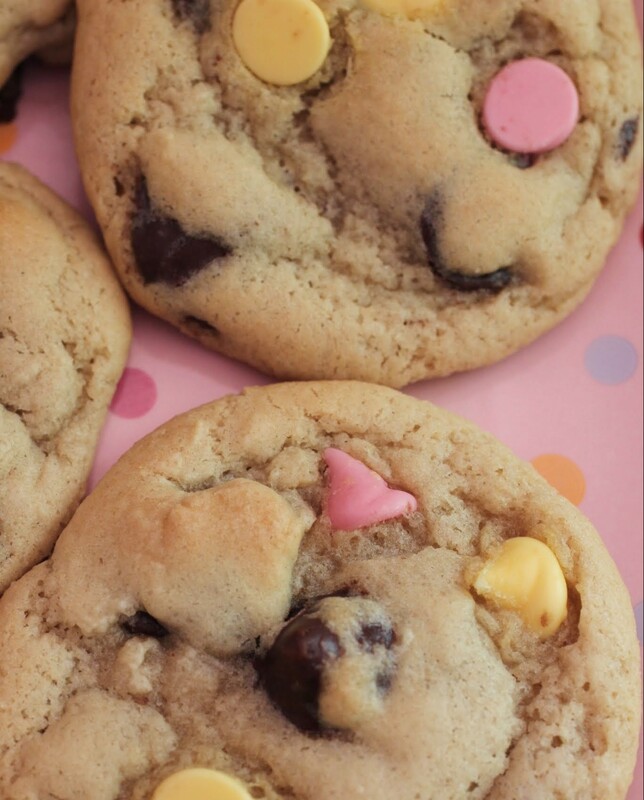 I definitely need to get my hands on some cherry filled chocolate chips! Love that you made these so springy too. These are such a perfect treat for this time of year. They’re delicious, Danielle. I’ve been eating them out of the bag, too. Must stop! Thanks, Michele! I can’t resist any cookie with cute chips inside. It’s a problem! They’re all pink and pretty, Cyndi. I recommend! Good advice about the cookies. I will do that! Whoa, you have to spend your whole day with people like me? Bless your heart Mir, no wonder you bake. Kidding. For reals though, I agree, it’s frustrating (and truly sad) when people give minimal effort. Congratulations to you for finishing the school year! And YES cherry blossoms are beautiful. And in cookie form, ridiculously delicious looking as well! Ha! You kid, but baking is excellent for stress. Congrats to you, too, on graduating and all that! Exciting! 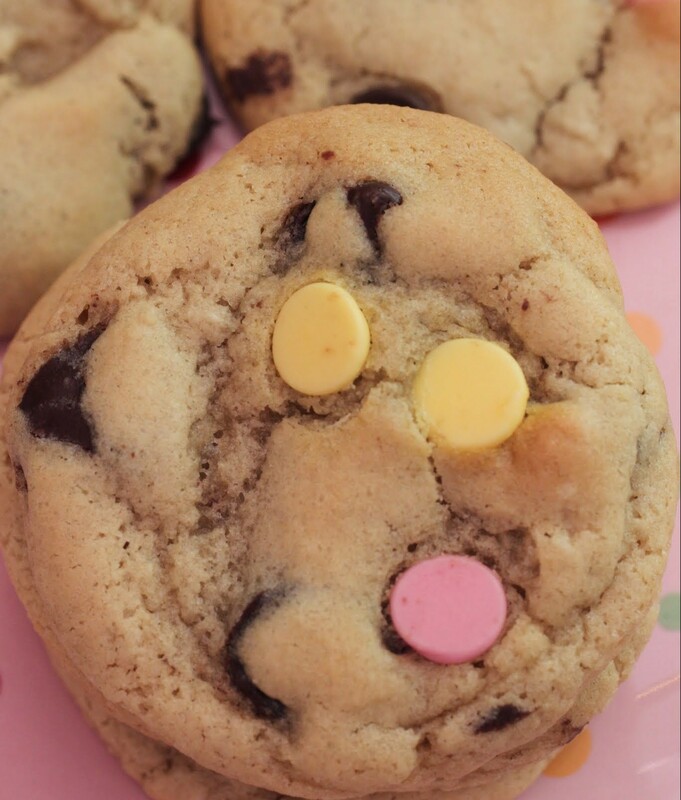 Those cookies sound amazing Mir – I love that you made a cherry blossom cookie! Aww how I wish I can get some of those spring blings here, they look so pretty on the cookies! Cookie bling is awesome. Maybe they’ll ship it your way? For a crazy fee? 🙂 Seriously, you can just use chocolate chips. It’ll taste the same! I have always wanted to go see the cherry blossoms. Maybe one day… 🙂 Until then…cookies!! They are pretty worth it. But cookies will sub in very nicely! Fighting kids with studying and HW is the worst, Jocelyn! I’m glad you’re out of the woods for a few months. Thanks so much!